Thank you to Staci at Going Nutty and Sara at Smiling in Second Grade! Staci gave me the Top 10 award and Sara gave me the One Lovely Blog award. I'm sure both of the awards are asking me to give them to like 100 other people, but I will just tell you about some little guys that I have recently found and now love! First up, Taylor at Baking... Crafting... and Teaching... Oh My! Taylor is an intervention specialist and has tons of sweet freebie games and activities! Her most recent freebie was a Bossy E game! We are totally doing bossy E right now (although my program calls it Super E.... I think)! Second, Molly at Lessons with Laughter! Molly teaches third grade, and also has cute freebies, like the desk monster one she posted recently! She also has a class blog which I am super interested in! I think my kids would really be down with a class blog that they could write in. And third, Laura from Mrs. Castro's Class! Laura has a special place in my heart because she and I are both in the suburbs of Chicago and she teaches bilingual second grade!! I think that is really wonderful. Also she found me on Goodreads, which is like my favorite thing besides teacher blogs and facebook... and pinterest... so I guess it's like my fourth favorite thing, haha. Besides all of that, she has sweet ideas, like her rounding idea that I pinned! So go check those people out. In other news, we had a crazy snowstorm last night and we got 5 inches of snow! 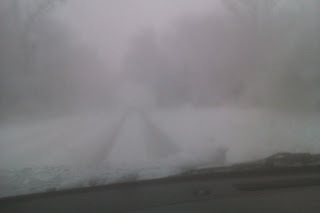 This means that my drive home was ridic since no one felt the need to plow. I took a picture out the window for you to show you... and don't worry, although I was driving at the time, I was going 5 MPH and there were no other cars on the road! It was like a white-out or something! And it was still snowing hard on the way home. When I was almost home, my car drove itself across the road and almost into a ditch! Luckily it wasn't in a ditch and I just reversed out of there but it was pretty scary. So when I did get home, I immediately changed into my pajamas and took a nap!! And since this post was pretty pointless (unless you are awesome and check out one of my buddies up there), I will leave you with a new Hey Girl that I'm pretty sure is directed at me specifically. Now when I hit the snooze on Monday, I'll just tell myself that Ryan Gosling says it's cool. Thanks for giving me some new blogs to follow. I love these Hey Girl pictures. They crack me up! The Hey Girl poster is HILARIOUS! Hey Jill, I thought I would stop by and lo and behold I'm mentioned in your post! Gracias, gracias, gracias! We've got to stick together - us girls from the suburbs, goodreadaholics, etc.! Speaking of which, it's crazy you got so much snow being just a bit more north than us, we didn't get hardly anything. Enjoy the rest of your weekend! Right?? My boyfriend lives on the north side and it said it only rained in the city! Not fair. Know what else isn't fair - that seems to always start snowing in the afternoon, just in time for our commute home. What's with that? Why can't it start snowing at 4 in the morning so we can have 1 snow day? Sigh, weather in Illinois...can't win!